Youthful Essentials acne skincare products are designed to help restore adult and teenage skin with the most advanced natural ingredients available. Visit us now to order your product! Natural Facial Moisturizer 2 oz. Natural Face Cleanser 4 oz. A natural oil free moisturizer formulated to stimulate. A Truly Natural Skin Care Products For Revitalizing Your Entire Body! A clear, radiant complexion… skin tone that’s fairly glowing… vibrant, alive and healthy. 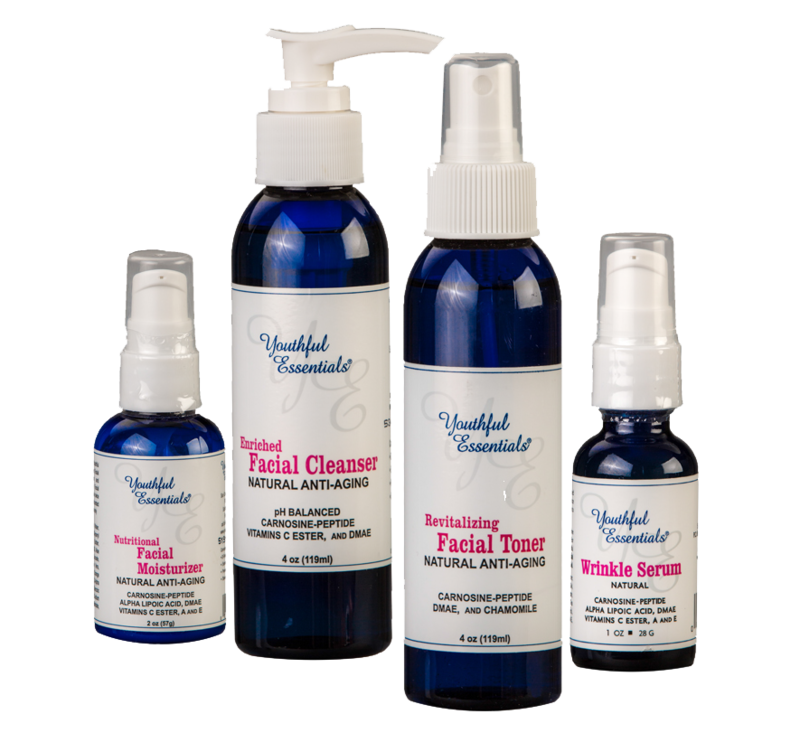 This and more is what you’re going to find at Youthful Essentials. For over a decade, we’ve created what many of our loyal customers believe are the finest, most skin-friendly line of cosmetics and body lotions available. Not only will our natural skin care products aid in restoring what time is slowly taking away, but they will actually factor in reversing the aging process itself – returning your skin to the freshness of youth. The bio-identical anti-aging skin care ingredients we use are as close to nature as possible – working deep within the dermis, and not just masking the outside. You're Going To Be Thrilled – Guaranteed! You must be 100% satisfied with your purchase, or we’ll refund your money. No gimmicks. No fine print. No exceptions! Use twice daily as a gentle cleanser. Apply with cotton pad after cleansing. Tired of those distressing wrinkles, lines and creases? Our Wrinkle Serum is the answer! Apply this creamy Facial Moisturizer in the morning and night, 15 minutes after applying your Wrinkle Serum.